Every learner needs to use their research skills for one assignment or another. How do we help them sift through information to get at the best and most reliable content? As in life, we know that not everything on the Internet is true. Sooner or later, our children are going to have to acquire good research skills. This is a discussion about how to teach them. Prepare to guide them through this process daily if not weekly, and not just in the library. As you’ll see, the cards are stacked against kids from really getting at good reliable information. It’s important to provide ample practice on finding good information. Kids need to understand the age of information and how the Internet is used in marketing. Why not show a video about it? A few that come to mind are Consuming Kids, or How the Kids Took Over. This will help to frame what kind of sorting out they’ll have to do when building their research skills while knowing the game that is being played against them. Find a tutorial and walk them through using research skills on the Internet. 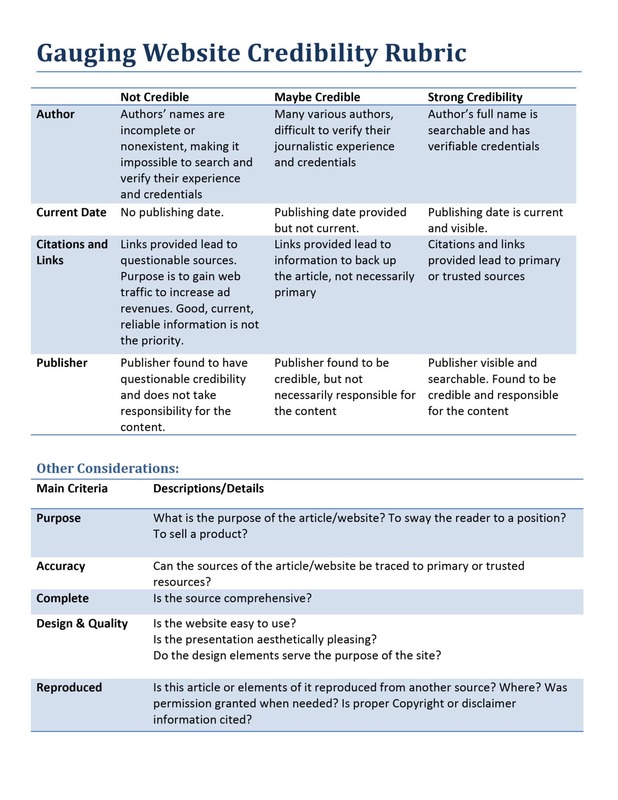 Since much research is done online nowadays, you may find the following rubric for determining website credibility useful. Pull up websites and test them for credibility with the chart above. You can also try an assignment that restricts students from using Google as the primary search engine. Here’s a good list to use. Google does not display all search results available. Know which sites your teacher wants you to use and to avoid. Know what kind of paper you’re writing (formal, informal, analytical, etc. ); this should lead you to the kind of information you are looking for. Always check your work for plagiarism, violation of copyright, citations and references. Your credibility is on the line when you violate any of these rules. See how to properly cite a website here. These resources will no doubt challenge your learners to keep their projects credible and accurate. It will save both you and them valuable time and hassle in college if they learn these research skills early. It will also help them in the long run to find the best information to make critical decisions about their lives.